Maybe no race is as open to some crazy turnarounds as the 4x200m, and much here depends on which guys are put into each team's lineup. LL winner and top-seeded Greenwich has only the 6th best time in CT this year. The best time is owned by S winner and 4th seeded Bloomfield at 1:31.46. Norwich FA has the second best time but is seeded 12th after a 7th place finish in LL. Hamden should be in strong contention after a 2nd in the LL and a 5th best CT ranking from a 2nd at Yale. The 4x400m promises to be much better behaved than the 4x200m, as the top two teams from the Class meet also are the top two in the state rankings. S winner Bloomfield won at Yale with a time of 3:22.22, and M winner Hillhouse was 2nd at Yale at 3:25.94. Among the other top contenders here are the teams ranked 3rd through 6th in CT, M runner-up Weston, LL winner Hall, Glastonbury, and Danbury. Last year Xavier won by 1 1/2 seconds over Fairfield Prep, but this year despite being ranked CT #1 at 8:00.34 (Milllrose Games on Feb. 9) by a huge margin, the Falcons are seeded 12th after a 3rd place finish in Class L. The potential lineup with a rested Pierre Sylvain looks pretty scary for a 12th seed team, however, so a repeat title could be possible. Top seeded Suffield will be the main competition after an 8:05.73 in Class M. LL winner Glastonbury should also be in it with the next three teams from the LL race, Staples, Wilbur Cross, and Hall. 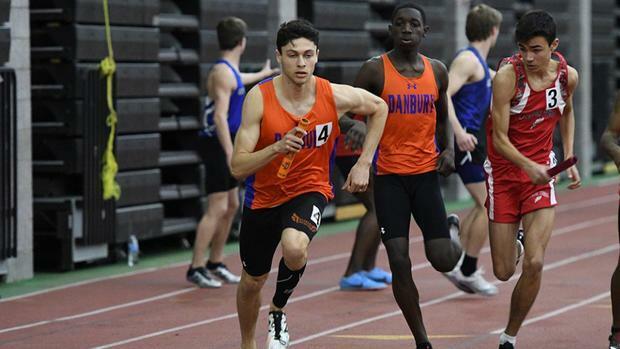 LL winner Danbury, L champ Xavier, and M winner Stonington are all among the top 5 teams in the state who have run under 3:41. Hall also has a solid squad and was 2nd in the LL, while Hillhouse and Wilbur Cross are ranked among the top 5 teams but may not have enough top runners to spare for this relay.